Updated 8/09/17 - Currently no jobs at Walnut Creek Presbyterian Church, MOPS Program in Walnut Creek, CA. Two Monday mornings/month and each Wednesday morning, Jan.-May from 9 -11:30am. 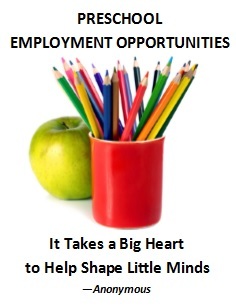 Experienced childcare providers needed to lead in our classrooms for an extensive, thriving MOPS program. Children's ages range from infant to 2 months to 5 years in Mops, and 2-3 years old in our Wednesday classrooms. Be a part of a Christian environment supporting young families as they grow in community, while we care for their young children.